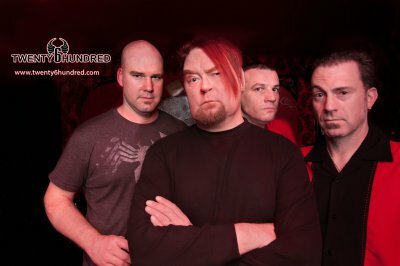 TWENTY6HUNDRED is a Canadian rock band formed in early 2006 by Michael Atkinson (former front man of popular 90’s bands: ‘Another Fine Mess’ and ‘Sneaky Preacher’). Although a solo project was the original intention, Michael recruited former ‘Sneaky Preacher’ band-mates Wendel Shank on guitar, and Randy Nolson on drums in an attempt to rekindle some of the performance magic of previous collaborations. Jim Burdon was soon enlisted to play bass. Traditionally a guitarist, Jim brought an exciting flare and energy to the rhythm section while adopting this different role. With the band members in place, the name TWENTY6HUNDRED was chosen as a tribute to an icon from an era that significantly influenced each of the band members in life and music. Following the release of TWENTY6HUNDRED’s 2006 debut E.P. “Free With Purchase”, recorded at Toronto’s Metalworks Studios, the band began performing live at some of the most renowned venues in Toronto; such as the Rivoli, Lee’s Palace, Opera House and El Mocambo. The band quickly discovered a dynamic stage presence, and easily captivated a fan base that grew with each show. The construction of a private recording and rehearsal studio known to the band as “Shocker Sound” in 2008 became an important outlet for creating new material, and developing a distinct musical identity. The first independent release produced entirely by the band itself at Shocker Sound was a 3-song demo entitled “Red, Black & Blue”. In autumn 2009, following a lively showcase performing alongside Toronto Indie alumnae including The Kernals, The Benvereens and Organical; Michael was forced to take a temporary break from playing music; then in early 2010, Wendel Shank decided to leave the band to pursue a different artistic direction. In early 2011, TWENTY6HUNDRED resumed work as a trio. The band’s first return to the stage was on August 1, 2011 playing in front of thousands at Yonge-Dundas Square as a part of the FOFSTOCK music festival. Following an amazing day on one of Toronto’s biggest and best stages, the band looked towards reforming the quartet. Mihai Trusca joined the band in 2012 to not only restore the second guitar and additional backing vocals, but also providing a fresh and creative production and recording perspective. The quartet completed their third major recording entitled “Electric For All” in September 2014. This 12-song LP was recorded entirely at the bands’ own private studios (GladLand, Orange Mic, Shocker Sound & El Rancho Randillion). Following the release of the new album on CD, and by download at various digital music stores and streaming services including: iTunes, Amazon Music, Rhapsody, Spotify, XBox Music and Sony’s Music Unlimited, the band is looking forward to sharing songs from the new album on stage while continuing to write and record new material for future release.